I saw Aerin Lauder in person once, just for a few fleeting seconds. She was sitting in a lunch meeting at an uptown eatery in Manhattan. She looked just as she often looks in photographs: very pretty, very polished, reserved and just a touch skeptical. I kept thinking of that sighting when I was trying out Rose de Grasse, a new floral fragrance for women recently launched by Lauder's namesake Aerin brand. Rose de Grasse is described as a "captivating scent — pristine, sophisticated, unexpected and iconic," and an homage to several varieties of roses. It combines notes of centifolia rose, Bulgarian rose and "rose absolute" (no specific rose named here) with ambrette seed, a "watery accord," violet wood, ambrox and musk. My main impression is that Rose de Grasse is made with good-quality ingredients, even if leans more towards the "pristine and sophisticated" rather than the "unexpected and iconic." This is a fresh and airy rose fragrance, in keeping with the Aerin brand and its casual-yet-cultivated aesthetic. It opens with the promised "watery accord," and this is my least favorite part of the fragrance. I feel like it's there just to reassure potential customers that Rose de Grasse is "not your grandmother's perfume." (I can't believe sales associates are still saying this to me in regard to rose scents, but they are — even when they know I write about perfume, even as recently as this very morning.) In any case, this breezy, aquatic opening also seems to include some freesia and other spring-y floral notes. To my great relief, Rose de Grasse eases the wearer into its "rose fusion" without too much of a wait. These roses definitely smell pink and white, if you know what I mean; they're not rich or powdery or spicy, just diaphanous and almost soapy-clean. The base is a light, fruity-musky ambrette with some very sheer woods. The imagery on the Rose de Grasse website (sunlit gardens, open windows, crisp white lace) conveys the fragrance perfectly, in fact. There's even a Rose de Grasse "inspiration board" on Pinterest, for further visuals. Rose de Grasse reminds me somewhat of Lancôme's Mille et Une Roses, perhaps with less amber, and Robin's description of that fragrance could also be applied here: it's "relatively unembellished," with "a modern, unfussy quality; it is the sort of fragrance that might convert even a hardened rose-hater." I'd recommend it to someone who enjoyed wearing Stella McCartney Stella in the mid- to late-2000s and now has the desire (and the increased income) for something a little more refined. Rose de Grasse is packaged in an opaque white bottle with a square gold label and a sculpted circular cap. It reminds me of Giorgio Armani's Armani/Privé collection, but then again, there are only so many perfume bottle ideas to go around, and at least this is an attractive one. It would look lovely on any style of dressing table, antique or modern. And there, I suppose, is the virtue of Rose de Grasse and the other Aerin fragrances: their very transparency makes them versatile and broadly appealing. Rose de Grasse didn't make my heart race, but it did make me feel calm and ladylike and, yes, just the slightest bit blasé. Aerin Rose de Grasse is the first fragrance in a new Premier collection from Aerin. It is available as 50 ml ($185) Parfum. I found Estee’s autobiography recently at a used book shop. In addition to being a completely delightful read from a hell of a broad, it’s very interesting to read Estee’s description of Aerin knowing how history played out. I haven’t been particularly impressed or disappointed with any of the Aerin scents so far. They’re all perfectly fine, if completely overpriced. I need to buy that memoir next time I spot it in a used bookstore! EL was an impressive lady. I agree — the prices seem high for these fragrances, but I’m sure Lauder know exactly what they’re doing. Its a great book and well worth a read. Some really great stories in there. How dos history play out? What happened with Erin and Estee? Thanks for reviewing this Jessica. My rep gave me a sample of this and I am sniffing it now. I agree with everything you said.I would add that it is overpriced for what it is and the new Private Collection she did while spendy is better. I think the Private Collection Amber Ylang and Tuberose Gardenia are both gorgeous and worth the cash! I agree with both of you on the PC fragrances. Happy Birthday! What a pretty gift for yourself. I’m probably not the target Aerin customer… but perhaps if my style were more neutral/classic and I had more money to spend and I weren’t obsessed with perfume… it might just hit the spot! Actually, I did love simple, transparent rose fragrances when I was in my earlier 20s, but I wouldn’t have had $185 to spend!! I don’t understand what Aerin is trying to do with her line. Seems to me like she is hoping straddle the line between niche and really upscale Tory Burch, which drains any of the remaining interest I had when the first scents came out. $185 dollars is a lot of money for something non-Malle for my taste! Wondering if they will discontinue Private Collection line and/or put all the classic EL scents in that grouping so they can charge more a la YSL? I agree that one could find something much more interesting for that price, and I hope that they’ll never cut the EL classics. I admire White Linen and Pleasures and all the older ones (PC, Aliage, et al. ), even if they’re not quite my style. I suppose these fragrances are meant to fit into the larger Aerin lifestyle brand, which seems to include all sorts of home decor? It’s all very consistent, and the fragrances suit that “world” very well. And while I’m at it, will just say that I think she’s trying to out-Tory-Burch Tory Burch. The funny thing about that “not like your grandmother” line is that in another ten years or so the aquatic accord *will* be the perfume worn by grandmothers. Time stands still only for perfume sales departments. P.S. Why does every rose frag attempt to convert rose haters? We don’t see this with any other accord, do we? Hah! This is all so true. No one says, “it’s not your grandmother’s bergamot/iris/vanilla/gardenia/whatever”… but they’re always so darned apologetic and defensive about roses. I love the EL Classics. Tuscany Per Donna is my fave. Hope they never stop making that one. Also love Pleasures..I did love Beautiful..it smells a lot different to me now..reform I am guessing. White Linen, while I probably wouldn’t wear it..I do appreciate it. Cinnabar..one I appreciate but not sure I’d buy. 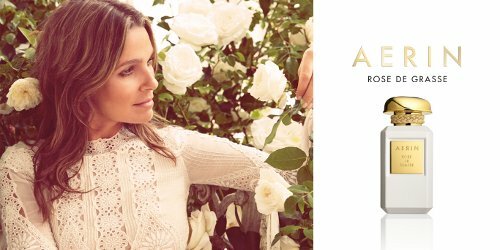 Aerin Lauder ads remind me of yes, Tory Birch or some kind of much lighter version of Martha Stewart. Kind of stale, refined, doesn’t seem to be personable…and yep, perfect for home decor or a house paint line at Home Depot. Not so much perfume though. I have no interest to try these for some reason. I just think of eau de white musk when I see these perfumes. Not something I’d be interested in. Omega, I don’t think you’d be particularly enamored of this fragrance! There’s definitely a target audience out there — we’ve all seen them — but it’s not the perfumista crowd. And that’s fine! Tuscany is a good one! and one of my aunts wore Beautiful for a long time, and it always smelled wonderful on her. I want a fragrance that is going to “wow” me and it sounds Like this isn’t the one that will do that for me. I like Aerin fragrances. Ikat Jasmine is my favorite. No, I don’t think any of these fragrances are designed to “wow”! That’s just not their approach. I really do like the “Ikat” and “Rattan” names, though. It’s a smart fit for the rest of the Aerin home line. There seem to be SO many rose soliflores coming out recently (and still to come). I love the note but is it enjoying some kind of major resurgence? I would assume. This sounds pleasant enough, but that price point is somewhat high (though it’s labeled as parfum), and not sure I’m the target market. I guess the bottle is okay, but it’s not my aesthetic I guess as it strikes me as rather cheap looking. I really don’t like the braided cord. I guess the good thing about all these rose scents is that there’s a new one–either already or soon to be launched–that’s BOUND to appeal to anyone who likes roses. I can’t figure out this rose wave of early 2015, either — and I still have another rose review or two to write! I’m sure some of the releases have been timed for Valentine’s Day, but not all. And you’re right — there might be something for every rose-lover in the batch! Nice review, Jessica. I’m not THAT into roses but will look for it the next time I’m at a store that carries the Aerin line. Just wondering hypothetically — if the brand for this specific perfume was “Parfums DelRae” and $150 for 50 mLs, would it still get comments such as it is too expensive for what it is? Your description of the opening makes it sound like deodorant or some other personal hygiene product. Glad to hear that that part doesn’t last long. Heh! Yes, there’s something just a teensy bit functional about that part of the fragrance. Oh Jessica! Thank you so much for this review! I have yet to see the perfume in person but between the idea of an elegant rose (and in parfum!) and the beautiful bottle, I really wanted to blind buy it. But I kept telling myself “Hang on! Jessica should have a review on this rose. Wait for it!” and here it is! So, thank you! Reading your review, I think it is pretty similar to how I envisioned it. I am totally with you on the bottle looking like a Prive, that was my first impression too! The aquatic opening made me wince a little; but then again thats a trait I find in her perfume collection so I shouldn’t be too surprised, I guess. Just one question though, seeing that its quite transparent a rose, hows the longevity? I’m so glad! And there will be more rose reviews to come — we’re having a big rose season! The longevity for this fragrance is quite good, considering its sheerness. It’s supposedly a Parfum; I don’t know about that, but it does feel like a durable Eau de Parfum. It has moderate sillage, noticeable but not strong (again, due to the sheerness). I’ll be snarky and say that a scent fresh out on the shelves can’t possibly be iconic. The icon status is something you earn imho :). I couldn’t agree with you more. I wince when I see that word applied to 25-year-old singers and actresses who are new on the scene. I am a long-time rose hater and this converted me. It’s efficient, prissy and a bit uptight, but in a pleasing way. I can imagine reading in a library with a lovely little garden beginning to grow in the windows. I like it. Jessica, thanks for your notes on Rose de Grasse by Aerin. I have smelled it and also dislike the water accord. It’s also extremely mild on me. In search of a similar fragrance I blind ordered Lancôme Mille et Une Roses. You say that MeUR has amber, but does it take away from the “rosiness” of the fragrance compared to Aerin RdG? Do you prefer one of these to the other? Why? Thanks!